If you need an efficient combination of a man and van for your house or office removal in Crouch End, then simply contact us and book any of our highly professional and yet quite affordable moving services. We can come anywhere in N8 at any time that is convenient for you. You can get prompt and competent support at any stage as we provide 24/7 customer care. We offer expedient and moderately priced furniture moving solutions for the entire area of Crouch End. We have vans of different sizes that can easily accommodate a piano or a mattress or any other larger item. All our vehicles come fully equipped with professional trolleys, moving belts and safety blankets, so you don’t need to worry about the safe transportation of your goods. Besides our movers are seasoned in handling valuables and antiques and will take proper care of every item. Full insurance coverage also applies for all furniture collection and delivery services we provide in N8. 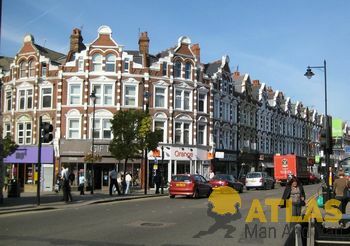 Crouch End is located in a valley in north London. It is home of the famous actor Simon Pegg. The area is serviced by several busses, the tube and the railway. There are several parks in the location and one of its most prominent buildings is the modernistic Hornsey Town Hall. The public library is called Hornsey Library and in 1990s Dave Stewart of the Eurythmics opened a recording studio in the old church and named it The Church.